Disclosure: My friend Anne received the Snackeez for review. All opinions are her own. Snackeez! is a snack and drink in one cup. 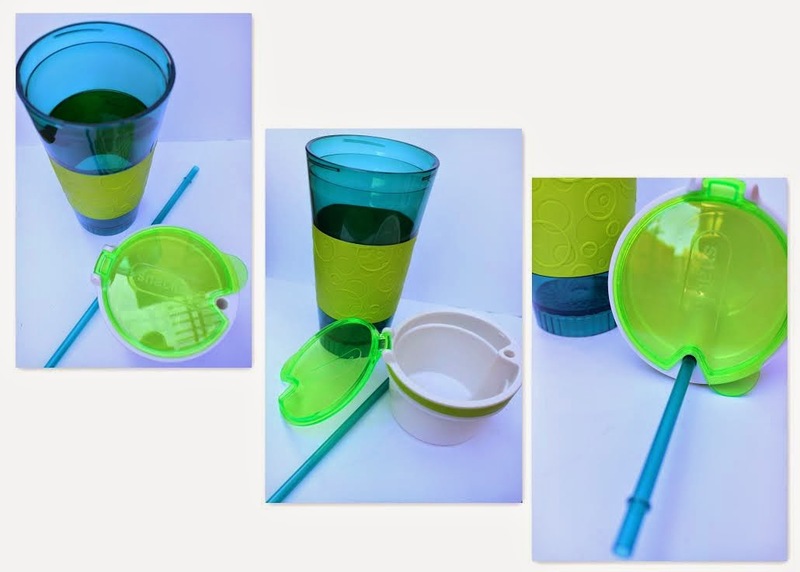 The snack and drink cup is made of plastic and the drink cup holds 16 ounces of liquid while the snack cup holds 4 ounces of a snack. Snackeez! also comes with a plastic straw that inserts easily through the side of the snack cup and down to the drink cup. The straw comes with a small lid so if the cup falls over or drops, liquid will not leak. The snack cup fits snuggly into the drink cup and has a see-through plastic flip lid that snaps shut when not in use so food won’t spill out. The see-through colored lid is great because you can see what is in the snack cup. 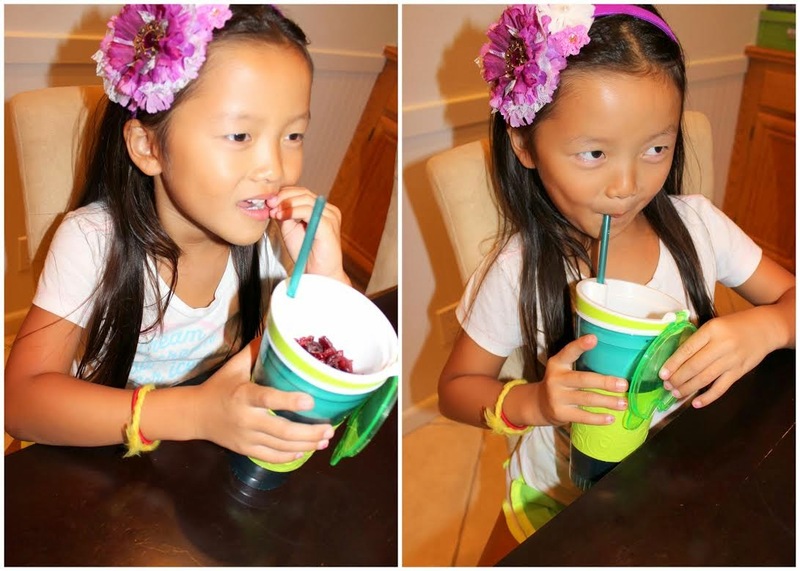 The drink cup is has a non-slip grip that makes holding the cup easy, even for the smallest of hands. The grip is 3” long which is a generous size allowing the hand to have a comfortable grip. All the pieces of the Snackeez! Snack and Drink Cup fit so well together that even when dropped, liquid or food does not spill. 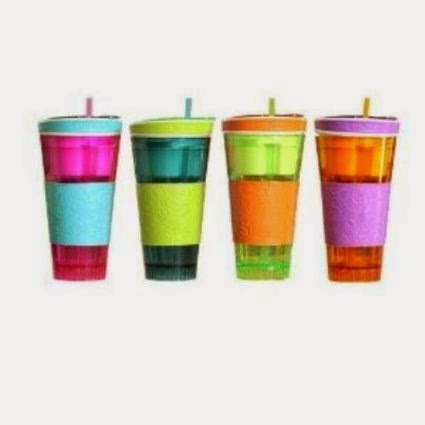 The snack cup has an insert allowing the straw to go through the entire cup which is a clever design. Snackeez! fits perfectly in a cup holder too. There is a wonderful selection of 4 colors and is available online or in major big box stores like Target or Walmart. Overall, the concept is ingenious and practical. Kids and adults can enjoy Snackeez! in the car, at home, at work, or anywhere. There was nothing I found that I (or my 7-year-old) did not like about the snack and drink cup. It is recommended for ages 8 years and up. One winner will Receive a Snackeez! It would be ideal for the kids to have in the car!! The Snackeez looks innovative and useful, so it would be great to win! Thank you! I would love this for when my kids have to take a snack in the car! Dd has been asking for this so she can eat in the car and not make such a big mess! This would be great for on the go for my daughter! This would be great for roadtrips! Id love these for my kids for car trips! What a great idea! I'd like to win this for my son. He would think it's really cool. I have young children so I am thinking this will make things easier. I would much rather clean up food/snacks than a spill. I'd love to win because i think it would be convenient for car trips! I would love to win this so the kids would stop spilling their drinks in the car and living room. This would be perfect for my grandkids while riding in the car. This would be great for traveling in the car!